In 1961, Wally Funk was among the Mercury 13, the first group of American pilots to pass the Woman in Space programme. But none of the women ever went to space. In this offbeat odyssey, journalist and fellow space buff Sue Nelson travels with Wally as she races to make her own giant leap. The Mercury 13 were the first group of American pilots to pass the Woman in Space programme. Wally sailed through a series of rigorous physical and mental tests, with one of her scores beating all the male Mercury 7 astronauts’, including John Glenn’s, the first American in orbit. 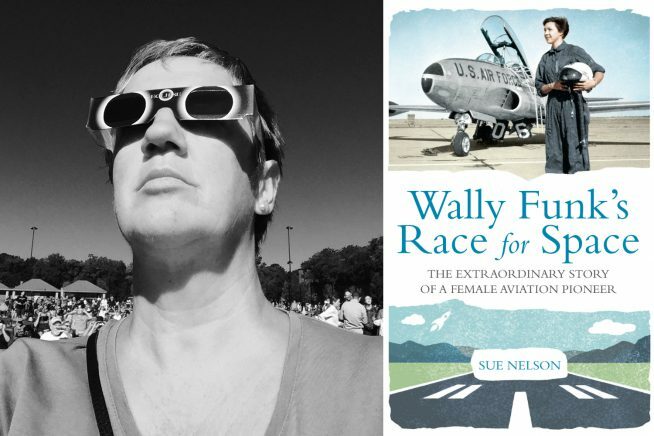 In her new book, journalist and space buff Sue Nelson joins Wally, now approaching her eightieth birthday, as she races to make her own giant leap, before it’s too late. Covering their travels across the United States and Europe – taking in NASA’s mission control in Houston, the European Space Agency’s HQ in Paris and Spaceport America in New Mexico, where Wally’s ride into space awaits – this is a uniquely intimate and entertaining portrait of a true aviation trailblazer. This event is part of Essex Book Festival’s Science & the Imagination weekendat Anglia Ruskin University and other venues in Chelmsford, taking place on Saturday 30 & Sunday 31 March.